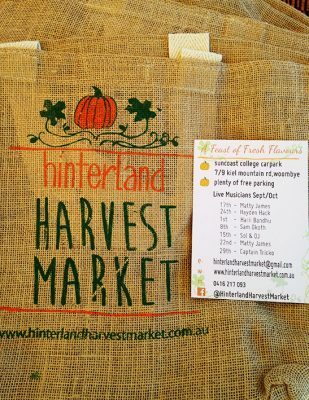 We are now at the new Hinterland Harvest Markets every Saturday morning at the Suncoast College Carpark, 7/9 Kiel Mountain Road, Woombye, just off Nambour Connection Road. 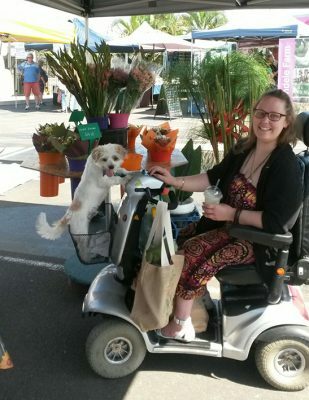 The markets are open from 6am until 11am every Saturday and there is ample parking and very easy access, so please come along and pick up your flowers early in the weekend. 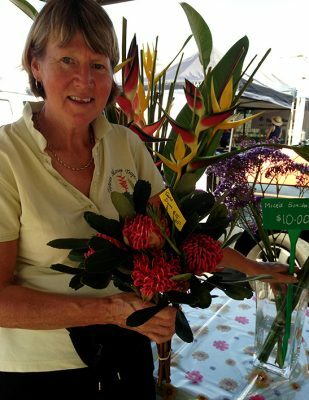 There are 50 other stalls at the markets selling a wide range of products including fresh farm produce direct from the growers with no middle man involved; great freshly made juices and cooked food for breakfast; music to entertain and under cover eating areas. This is a ‘real deal’ Farmers Market, not to be missed. Dogs are very welcome, so Sarah brought along Charlie this morning. The market area is on a sealed surface making access very easy even for motorised buggies and wheel chairs. If you miss us on Saturday, you can still catch up with us at our usual site at the Noosa Farmers Market on Sunday mornings.